I just ordered online a Pet Patio Potty for my dog. Upon its arrival, I got a bit confused on how to assemble it as I got the large type for my Labrador. 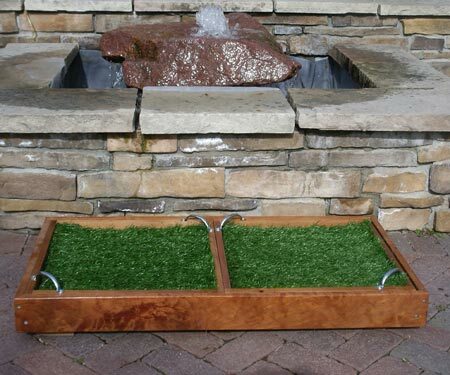 This product is made of patent pending layered design that consists of a box frame and removable trays suitable to hold either gravel or synthetic grass (or even wood pellets or real sod) for other model types. In my case, I have chosen to try out the gravel and perhaps switch to synthetic grass soon. The trays are placed over a layer of litter and dry absorbent material. In my few weeks of using it for my dog, I got surprised that it drains the urine of the dog on to the litter located beneath the trays. I never knew that the absorbent material would be as helpful as it makes the whole system free from dirt and unpleasant smell. Moreover, it helps reduce the development of bacteria and bad odor as it aids in keeping the unit clean. Upon delivery, Pet Patio came with a simple and easy to follow set of assembly and set-up instructions that includes photos. It made me a bit confused at first but the photos helped. The items you’d need in assembling the unit are all provided and it’s even nice to receive a Phillips head screwdriver go with the whole package! Unfortunately, the absorbent litter and gravel were not included in the delivery. The great experience I had while using Pet Patio Potty at my home is that I didn’t encounter any difficulty in cleaning the whole unit. The doggy paws never had the chance to come close with litter beneath the trays. It also helped that the handles on the trays made it easier for me to remove it from the box frame so I can also get to clean the litter layer. They have also provided the package with a convenient scoop so I can easily remove any solid litter. I must say that the smooth polyethylene tray bottoms helped as well it enabling me to clean the trays easily. Pet Patio Potty is an extraordinary dog litter box. I find it very stylish and easy to clean. The unit is handcrafted and I can fully customize it according to my dog’s preference and needs. Another good thing about this product is that it comes in different styles, sizes and materials to fit other needs of dog owners out there. How did Pet Patio Potty rate? Pet Patio Potty is made of patent pending layered design that consists of a box frame and removable trays suitable to hold either gravel or synthetic grass (or even real sod or wood pellets). The trays are positioned over a layer of litter or dry absorbent material. The dog’s urine gets drained through to the litter below the trays which reduced the development of any unpleasant odor and making cleaning the unit a snap. The product comes with an easy to follow Assembly and Set-up Instructions which are included including photos. All items required for assembly are provided and the end user gets to receive a Phillips head screwdriver. Although, the absorbent litter and gravel are not included. There is no mess in cleaning the Pet Patio Potty since doggy paws never come in contact with litter. The handles on the trays make them easy to remove from the box frame so that the litter layer below can be accessed. They also provide a convenient scoop to remove soiled litter. Moreover, the smooth polyethylene tray bottoms make cleaning the trays easy. Its unique dog litter box is stylish and easy to clean. Each unit is handcrafted, which allows you to fully customize the product for your dog. The item also comes in different styles, sizes and materials.